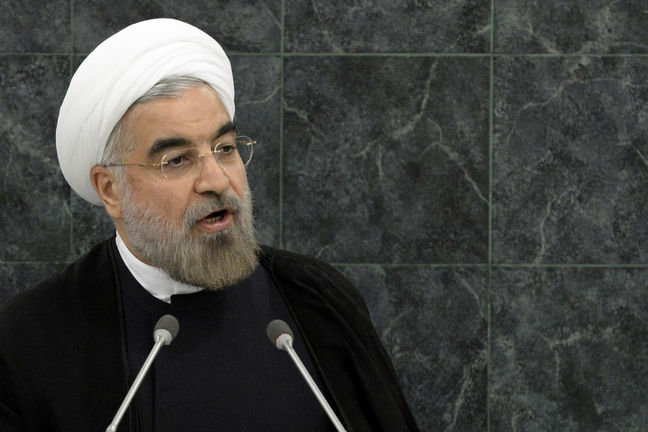 EghtesadOnline: President Hassan Rouhani says Iran is not afraid of foreign threats and intrigues, which have escalated under the belligerent government of US President Donald Trump. Rouhani made the announcement on Sunday as he took his new cabinet on a tour of Imam Khomeini’s mausoleum in southern Tehran to renew allegiance to the ideals of the Islamic Revolution, heralded by the late leader, PressTV reported. "We are not afraid of foreign threats and conspiracies, because we have learned from Imam [Khomeini] not to fear foreigners," the IRNA news agency quoted Rouhani as saying. Imam Khomeini, the president said, "taught us how a nation of strong will can confront all sorts of intrigues,” referring to the eight-year Iraqi imposed war of the 1980s under the former dictator Saddam Hussein. President Rouhani begins his new term as the Trump administration is trying to unravel a nuclear agreement which he advocated to be reached with the former US government and its European and Asian counterparts. Under Trump, Washington has imposed new sanctions on Tehran and is lately pushing for access to Iran's military sites. The US military is also constantly accusing Iranian naval patrols in the Persian Gulf of "harassing" American warships. Iranian military commanders say while their units continue routine operations, US naval units have changed their navigational patterns since Trump came into office and often engage in provocative maneuvers near Iran's vessels. Rouhani, however, said he is looking into the future on a more hopeful note than the past four years. “What is of significance is that the people’s hope in the future, their presence, and trust in the establishment and the government should remain in place,” the president said. "If the Leadership's guidance is on our side and the support, encouragement and the spinal column of the nation remains in the scene, we will certainly bypass the problems," Rouhani added. Otherwise, "we would not be expecting now to celebrate the 40th anniversary of the victory of the Islamic Revolution," Rouhani said. Rouhani won re-election back in May. He took the oath of office earlier this month after being formally endorsed as the chief executive by Leader of the Islamic Revolution Ayatollah Seyyed Ali Khamenei. Last Sunday, the Iranian parliament, Majlis, cleared all but one of his choices for the new cabinet. Rouhani said after four years in office, there is no room for trial and error in his new administration. "Today, more hopeful than the past four years and with a reserve of experience and a stronger will, we have prepared ourselves to fulfill the demands of the people," he said.